If I purchased a home with Unison HomeBuyer and sold it 30 years later, how much would I owe? Your home saw an average amount of appreciation (based on data from the Federal Reserve). The graph below shows how much equity you would gain and how much you would share with Unison over this 30-year time period. As you can see, both your equity and Unison's share increase when the home increases in value. However, your equity also grows when you make your mortgage payments every month. 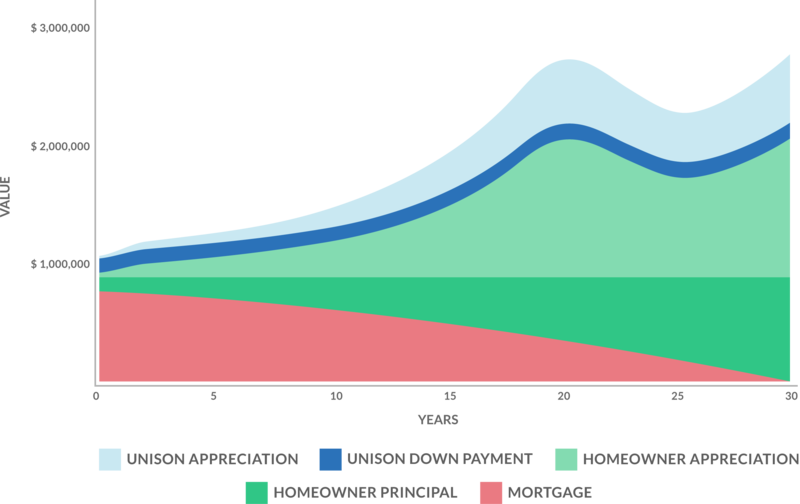 What if I don't have enough cash for at least 50 percent of the down payment with Unison HomeBuyer? In order to qualify for Unison HomeBuyer, we usually require you to have enough money available to pay half of the down payment in addition to any closing costs and other costs. However, if you don't have the required amount, we may still be able to help you purchase a home. Please contact us to see if we can work with you. I have a lender I am working with already. With Unison HomeBuyer, do I have to work with your partner lenders? You will need to work with one of our partner lenders since these companies are prepared to finalize a home purchase with the Unison HomeBuyer. We are constantly building partnerships with new lenders. Please contact us to see if there is a qualified lender in your area.